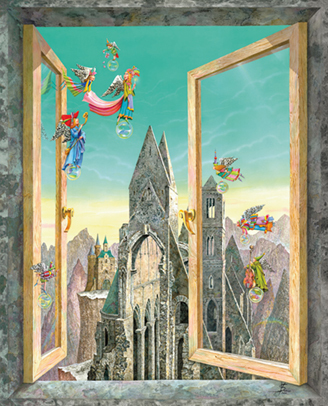 "A fantastic window 2" - it is a real window with a frame, though it you can see fantastic castle. Near are flying metallic fish with angels in armor. Viktor Shatunov is an illustrator and painter who creates realist images of fantasy scene. He is inspired by the possibility of self-expression through the creation of images. Viktor Shatunov was born in 1952 in Vilnius, Lithuania. He graduated from the art school of Venozinskis in Vilnius and graduated as a graphic designer from the Byelorussia Academy of Fine Arts in Minsk. To further his training, he went to the Leningrad Academy of Fine Arts (now St. Petersburg, Russia). Viktor has been active in book graphics since 1975, basically illustrating the classical works of art. In addition to this he works as a painter. Since 1978 he has been a member of the Union of Artists of the USSR, later Lithaunia. Since 1985 he has specialized in illustrating books for children. He showed his talents in more than 150 books, with a circulation of more than 20.000.000 copies in many countries, such as: USA, Japan, Russia, Republic of South Africa, Hungary, Czech Republic, Slovakia, Estonia, Yugoslavia, Poland, Byelorussia and Lithuania. He holds many diplomas in book graphic art design. Viktor earned different prizes at international exhibitions and competitions. Since 1990, he has not only illustrated books for children, but has written them as well. 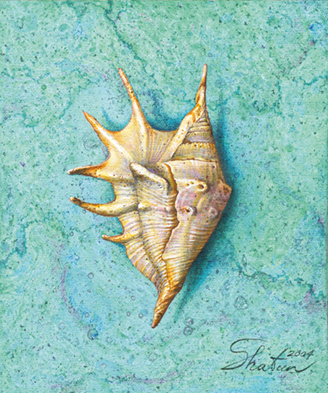 "A shell 6" - a drawing from nature - a shell. "A fantastic window" - it is a real window with a frame, though it you can see fantastic mountains and a castle. Near are flying beautiful colourful angels. 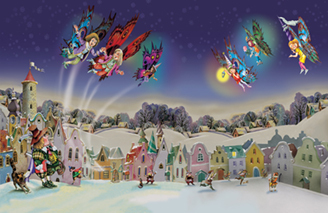 "The elves and a shoemaker 2" depicts a scene with elves. They have done their work and flew away. It is an illustration to the book.